I feel that the past month has been in overdrive and that I have had no time to write about my experiences and thoughts on life, love and the pursuit of happiness. These next few posts are going to be my attempt at catch up. One of the hardest aspects of living in NOLA for me is the weather. Here’s the thing: I love the seasons of the Midwest. My dad was a phys ed teacher while my sister and I were kids who believed in activity and exercise more than competition. My mom on the other hand just wanted us out of the house whenever the weather was bearable. This translated into my sister and I playing outside all year round. Swimming on Lake Charlevoix during the summer; skating on a Dad-made ice skating rink in the backyard during the winter; shooting hoops, playing catch, riding our bikes, etc. in the spring and fall. As I got older, I learned how to play golf and volleyball, scuba dive, rollerblade and backpack–I even did a couple of triathalons. I was an avid skier from 10-24 (ski patrol in the UP, ski bumming in Colorado) and then a wanna be avid skier from 25-41, skiing at least one weekend per winter. Granted, I missed the seasons when I was a Peace Corps Volunteer on Antigua, but the beautiful beaches and lovely sea water helped keep things in perspective. In NOLA, I’m a little more hard pressed. There are only about 2-3 months that I genuinely like weather wise: late-September thru early November and mid-March thru late-April when the temps are comparable to summertime in the Midwest. Golfing, biking and rollerblading are all doable and fun during these weeks. The nearly 6 months of intense heat during the summer, however, are miserable to this northern girl. I hibernate more living here than I ever did during my 5 winters attending NMU and living in Michigan’s Upper Peninsula where winters could be frigid. One of the hardest aspects of my cancer diagnosis has been that I am so far away from ‘home’ (Michigan & Chicago), so far away from my base and a solid support network. This little adventure in NOLA has tended to play out like that at a number of points along the way, but this cancer experience has been especially challenging. I miss my former public history classmates at Loyola University Chicago. I miss my former colleagues, teammates and comrades connected to Chicago Public Schools and all of the cool programs I was involved in. I miss shopping for clothes with Barb and at Ikea with Carol. I miss going out to eat and to the movies with the Girls. I am missing very formative years of our nieces and nephews lives. I’m missing family and friends being within a 4-hour drive. This experience has made me needy of friendships and connection in a way that I haven’t experienced since middle school–and lucky me, my base is over 900 miles away. However, it also means that I truly make the most out of any time I do get to spend with family and old friends. And that I did, this holiday season. Instead of going home for Thanksgiving this year as we had for the three years prior, we opted to go home for Christmas. We left NOLA on December 21st and drove to my parents’ in suburban Detroit with our two border collies, Zoey and Bleu, where we stayed until the 27th. High points: seeing snow on the ground for the first time in nearly four years, REI, going to see The Hobbit with Terry and my family, watching old family film that my parents had converted to DVD, fresh snowfall on both Christmas Eve and the 26th, spending time with terrific in-laws and friends (Elyse, has it really been almost 10 years? 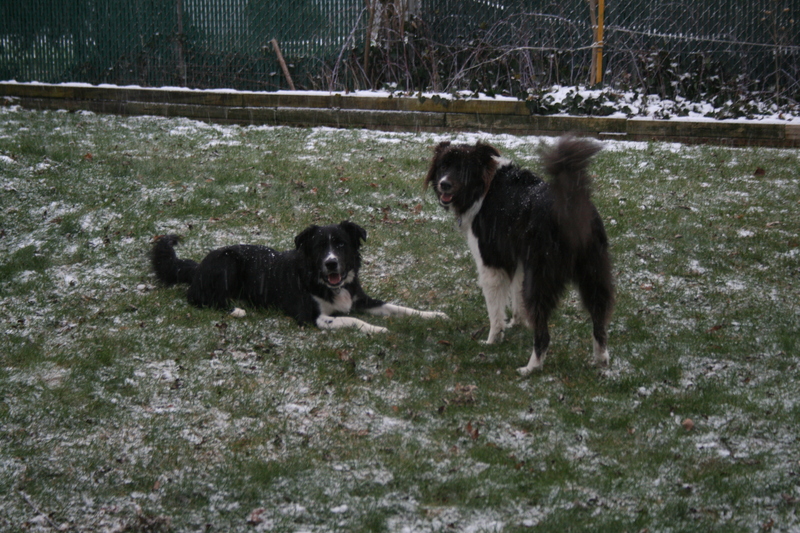 ), and watching Zoey & Bleu tear around my parent’s backyard with their dog cousin Magnus in the snow. Awesome memories. We then headed up to Lake Charlevoix (4 hr. drive) for a quick two nights at the Cottage with my parents, Barb and her son. Terry and I went skiing at Boyne Mountain and after being away from any slopes in nearly 4 years, I felt like I was dancing, able to play again on my skis. Not quite Colorado moguls or ice free , but considering the last time I was on my boards I tore my ACL, I was on a high for days knowing that I could still ski!!!! We then left my Fam and the Cottage to start our way back to NOLA. We visited with Terry’s Family in Grand Rapids and Kalamazoo before spending the night at our condo in Chicago (where more in-laws reside :-)). After a quick brunch with my good friend Carol at a very yummy Waffles and a stop at the infamous Garrett’s Popcorn we continued on, spending the night in Memphis in one of the nicest LaQuinta’s that we have stayed at in the past 3 years (since we added dogs to our lives). We rolled into NOLA at about 3:30PM on New Years Eve and thanks to a very full trip, we were in bed way before midnight. Old? I’d say we were worn out. This trip was a great way to wrap up 2012, ending the year on a high note. This entry was posted in Uncategorized and tagged Breast Cancer, holiday, skiing, snow. Bookmark the permalink.